Southern Maine's Most Desirable Cottage Resort Community. Our Cottage is rented during peak summer season on a weekly basis arriving and departure on Saturday during the peak summer season. We rent nightly (with a 3 night minimum), during the off-peak season. Summer Peak Season Saturday arrival 3:00 pm to Saturday check out 10:00 am during peak season. The Cottages at Summer Village is a gated 3-season cottage community just minutes from the sandy beaches of Wells, Maine. It is located on former farmland tucked off of Post Road and combines easy access to the beaches, shopping, restaurants, and other amenities of Wells,Ogunquit, Kennybunk. The cottages are carefully sited throughout the community for privacy while providing easy access to the many on-site amenities. Summer Village has a strict NO PETS policy for those renting cottages. Linens are NOT provided during your rental period – so please bring your favorite sheets, pillowcases, bath, hand, and beach towels. Linens can be rented from a local service in town if desired. High Speed WiFi Internet Service dedicated to your cottage Recently painted the cottage. Come and relax at Summer Village in a free standing two bedroom cottage featuring high ceilings, central air conditioning and central heat. Granite counter tops in the kitchen and bath, ceiling fans, a full kitchen, washer and dryer in the cottage, new private gas grill, WiFi Internet service in the cottage and wonderful community amenities. This community has an adult heated pool with spa , 2 family pools with kiddie pools(1 family pool heated), tennis courts, 2 play areas for children, shuffleboard, basketball court, volly ball court, baseball field and putting green. The on-site trolley links guests to all the great amenities. During the summer, the Summer Village Trolley runs the perimeter of the complex from 9:00 am to 9:00 pm. During off-peak months, the Trolley runs on weekends only. USA Today’s best coastal small town Ogunquit, Maine. The Cottages at Summer Village is a 65 acre, three-season resort community situated on the southern coast of Maine. Vacationers of all ages can enjoy a variety of activities or just relax in the peace and quiet of our natural setting. My privately-owned two bedroom cottage come fully equipped with everything you need for a perfect vacation. •Fully-equipped kitchens, including dishes, glasses, pots and pans, etc. Please note: Guests will need to bring bed sheets and bath towels, or arrange renting them from the linen supplier. Don’t want to bring your own linens? Beach Towels, Beach Chairs, Umbrella and Sunscreen!! Need a crib or high chair? We bought at Summer Village 13 years ago for a place of our own in the area we grew up. We have not retired as of yet so we decided to rent our cottage for others to enjoy and also for an investment. We have central air conditioning on a cul de sac street with minimal homes on the street. There is no one directly in front or behind our cottage. We have a newer 50" LG Smart TV flat screen . Our all season porch seats 6 comfortably at the dining table. We have parking for 2 cars at the cottage. You will love staying here! Central air conditioning 50" flat screen tv Extra large back yard Parking for 2 vehicles at the cottage Cul de sac street no thru traffic 1 house from the trolley pickup within Summer Village New private gas grill Freshly painted Pull out sofa You will love it here !! There are 3 pools in Summer Village. There are 2 family pools (1 heated) and 1 adult heated pool with a hot tub. There is also an internal trolley which will deliver you to any part of the Village (no need to drive!) Also the Wells Trolley Company will take you to Wells, Ogunquit, York, The Kennybunks, several other beach communities and other great locations for a small fee. One of the areas most popular beach is just minutes from the resort. (Wells Beach, Moody Beach, Drakes Island Beach, Ogunquit Beach) This is a No Smoking Cottage Thank you! Fantastic could not have been better!!! Thanks Susan this was a great place to stay. Everything was thought of. You will not be disappointed if you stay here. We will be back!!! 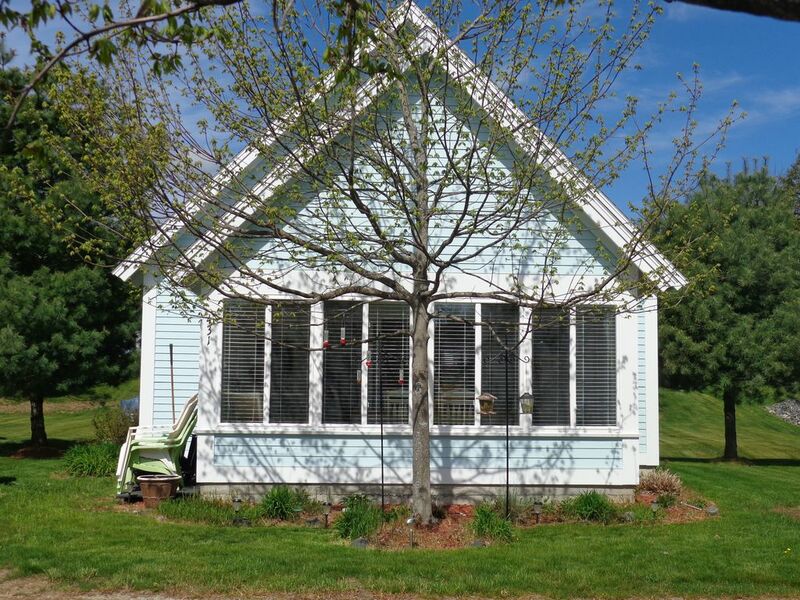 Convenient location near the beaches and coastal towns of Maine. Well equipped kitchen, comfortable living room and dining area. Great location, wonderful cottage. Loved it. Sensational! Extremely comfortable; spacious; modern amenities; clean & excellent location. My family (wife, son and in-laws) stayed for one week Aug 26- Sept.2, 2017 and absolutely loved this cottage. Stayed here three years in a row after visiting numerous other places in the past and this is the best! 2 bedroom; full-size bathroom; spacious kitchen; large, comfortable sitting area and beautiful sunny screened-in porch. Cottage has all the modern amenities: central AC; high speed WiFi; outdoor grill; washer/dryer; large flat screen TV and much more. The place is very cozy, with nice table lamps; ceiling fans and adjustable lighting. The cottage has a terrific beach theme and is very nicely decorated. Large, modern windows allow plenty of sunlight from dawn to dusk. Unit fully equipped with all the cooking utensils and flatware needed. Nice outdoor grill and Adirondack chairs. A grassy backyard with a small hill provides plenty of space for children to run around. My son loved it. Location is excellent too - higher up on the resort away from the entrance which gives you a chance to see the entire complex. Tennis courts walking distance and shuttle trolley takes you to any of three pools, park, playground, shuffle board, basketball court, game room, fitness center and more. I highly recommend this place for couples or families. Look no further! It's the best! We loved our stay at the Cottages at Summer Village. The community was child friendly with so many entertainment options including all the pools, playground and sports fields. The cottage was very well equipped and clean. We would return and perhaps for even longer next time. Very nice cottage with everything you could possibly need for a "feel at home" stay.